t*rexes and tiaras: You saw a prince from a fairytale.. I have to admit, I felt a lot happier in this outfit than the last time I wore this skirt. As soon as I spotted this jumper in store a few weeks ago, I knew I'd have to add it to my wishlist, so I was thrilled when M&S sent it to me. The perfect Christmas treat, but rabbits and hearts are not so festive that I won't be able to wear it into the new year. I've noticed that it's now in the sale. 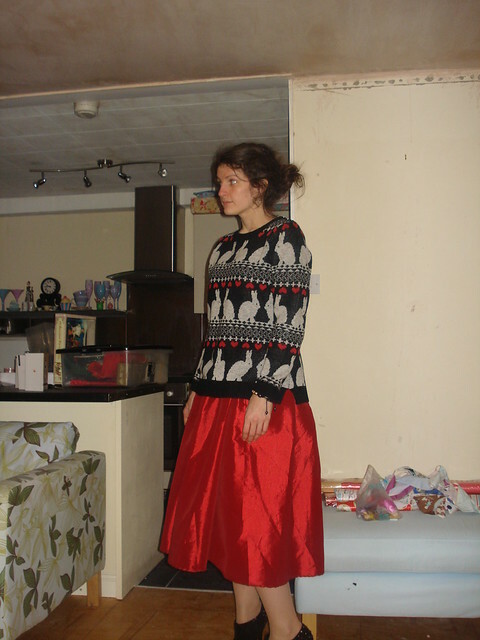 I thought the colour of the skirt went quite nicely with the red hearts in the jumper, and Christmas seems to be the time when one can get away with wearing huge red taffeta skirts to the office without any funny looks, whatsoever. 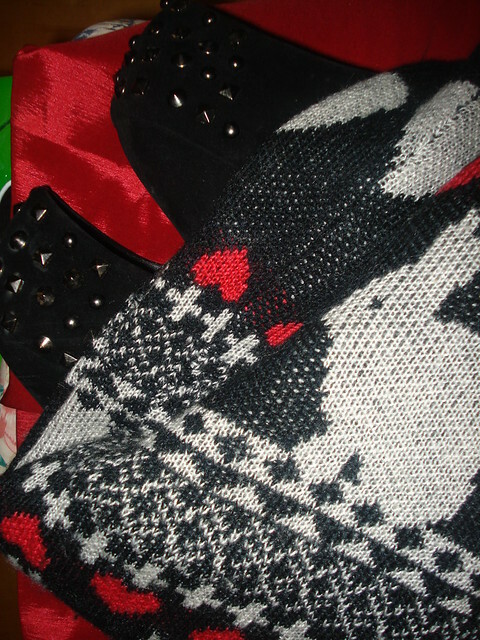 I kept the shoe boots fairly simple; the plain black studded ones I picked up when I struck charity shop gold a couple of months back. I think I'm well and truly on the festive bandwagon; I've been wearing these earrings all week. I think they remind me of tiny little Sylvanian Families. I used to have a huge collection of those when I was little; did anyone else collect them? I'm still feeling oh-so-behind with everything in the run-up to Christmas. I feel as though time is running out to get all of my gifts and cards out and on their way to their recipients. Luckily, one of my best friends has been a total lifesaver. She's basically wrapped up all of my presents for me, as I am beyond hopeless when it comes to wrapping gifts up neatly. I mean, I can make a pig's ear of rectangular things like books and DVDs, so when it comes to things like the baseball cap which I'm fairly sure my sister's boyfriend is going to love, I'm rather glad to have her help! I was a Sylvanian Families addict! Even when I stopped playing with them I collected them for a few years, I'm still got them hoarded. What an adorable jumper, love the bunnies and that skirt is beautiful! 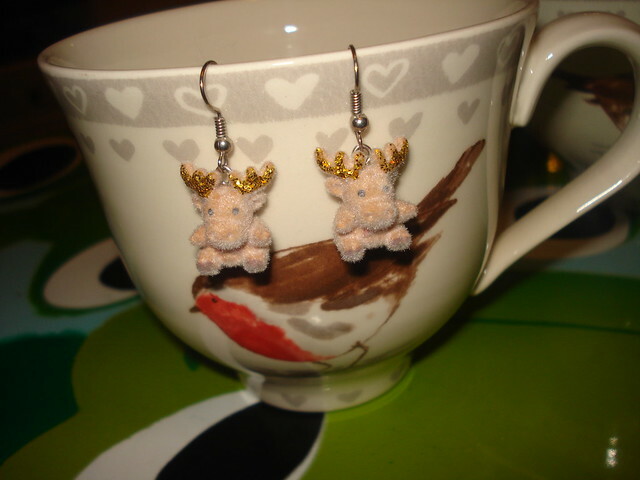 Your earrings are so cute, they are very much like Sylvanian Families - the cup is really nice too! That skirt is really nice. Are you wearing a petticoat underneath? I LOVE the jumper. So sad it's sold out online, but I wonder if I'll find it in store when I pop in to town on the weekend. I think it's looks perfect teamed with that gorgeous skirt. God, I love taffeta, that lovely swishing sound it makes. If glamorous were a fabric it would be taffeta! 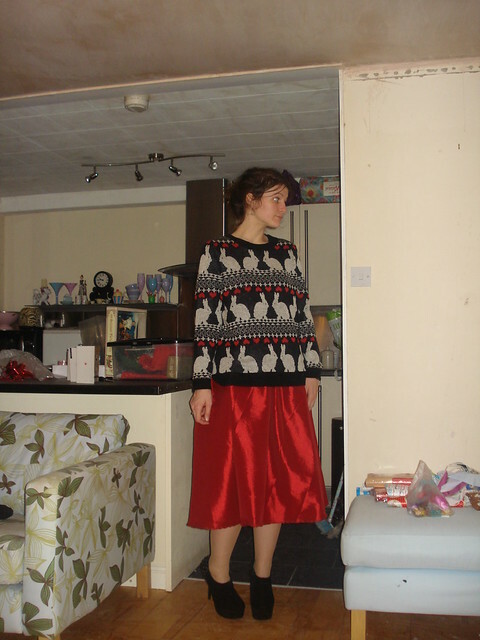 Looks fab and that jumper works really well; makes a brilliant outfit. I LOVE Sylvanian Families....I only had a couple because they were kinda before my time, but my little sister had (and still does) have loads and the house and an ice cream cart and everything. I love that everything looks 'real' and isn't all crap-barbie-pink! 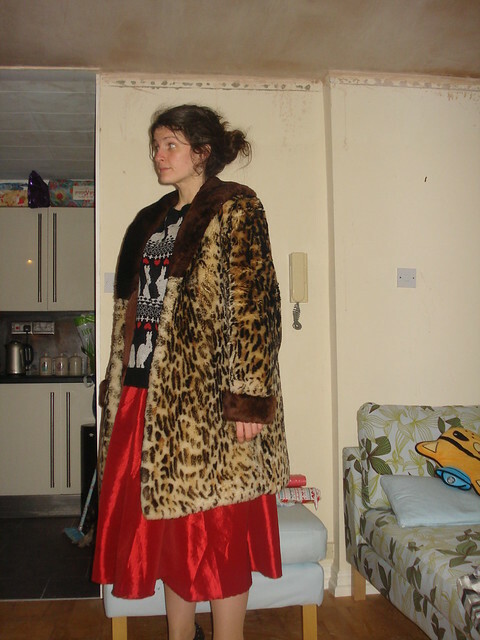 Anyway, this skirt is fab.